I am currently at the Mactan International Airport waiting for our delayed flight as I update this blog. I am about to embark on a quest that will span a long period of time, taking advantage of the holiday season in the Philippines and will require utmost consideration from my officemates, friends and family. Most travelers are hindered to travel abroad for reasons of visa grant and skyrocketing plane fares. Almost 7 years ago, I had my first Southeast Asian backpacking tour (not literally carrying a backpack but with my old luggage in tow) in the middle of my final examinations in law school. I did enjoy the experience that since then, it caused me to travel annually to any Southeast Asian destination. 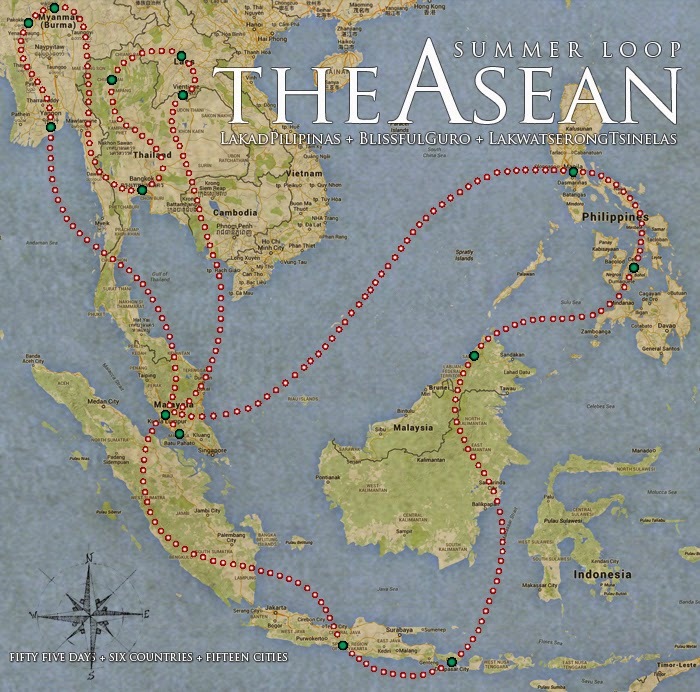 ASEAN is a 10-country political and economic association consisting of Malaysia, Indonesia, Singapore, Thailand, Brunei, Cambodia, the Philippines, Laos, Myanmar and Vietnam. Offering more than 140 routes across the Southeast Asia, AirAsia ASEAN Pass is the key to achieving another milestone in the world of travel. And this is an opportunity I will never let go this summer of 2015. 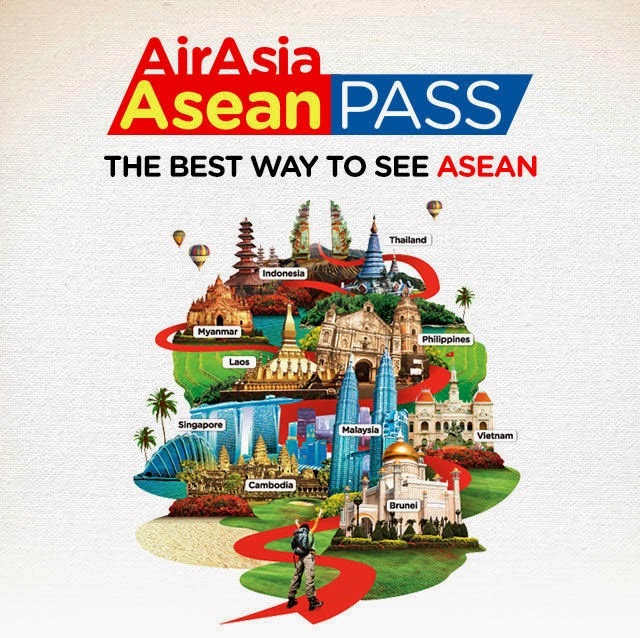 There are two categories of the AirAsia ASEAN Pass. These are: 10 credits 30 day travel validity (PhP7,200.00) and the 20 credits 60 days travel validity(PhP12,900.00). I opted for the former. How does the AirAsian Pass work? 1. Purchase AirAsia Asean Pass with your Big Shot login. 2. Select your preferred type of AirAsia ASEAN Pass and make your payment. 4. Your Asean Pass is now ready for redemption. 1. Redeem AirAsia Asean Pass with your Big Shot Login. 2. Select your AirAsia Asean Pass to redeem and make your flight selection. 4. Receive confirmation of your flight booking. 5. Enhance your journey with add-ons. The AirAsia Asean Pass is valid for one year from date of purchase. With Blissfulguro and LakadPilipinas on this quest, planning process became smooth while we discuss the same over bottles of beer in one random night. And the excitement continues. But this is something we haven’t planned for a long time as it was an instant planning motivated by my desire to visit one of my dream island destinations at a very affordable cost, even made possible by the world’s best low-cost carrier, Air Asia. Definition of affordable has never been precise until this moment. Last year, I’ve never visited any Southeast Asian country which is unusual for me. Tokyo, Kyoto, Nara, Osaka, Shanghai, Shuzhou, Macau and Hongkong were the key cities visited. This summer, an adventure is about to unfold as I return back to favorite Southeast Asian destinations and discover new ones including my dream island destination – Bali. Trucking Insurance. Let me teach you the way you find the best value travel cover.